Simple and detailed by the chain, absolutely perfect for everyday wear. Material. Material ___________________________ • Coral dyed, lacquered metal, gold plated beads, brass. 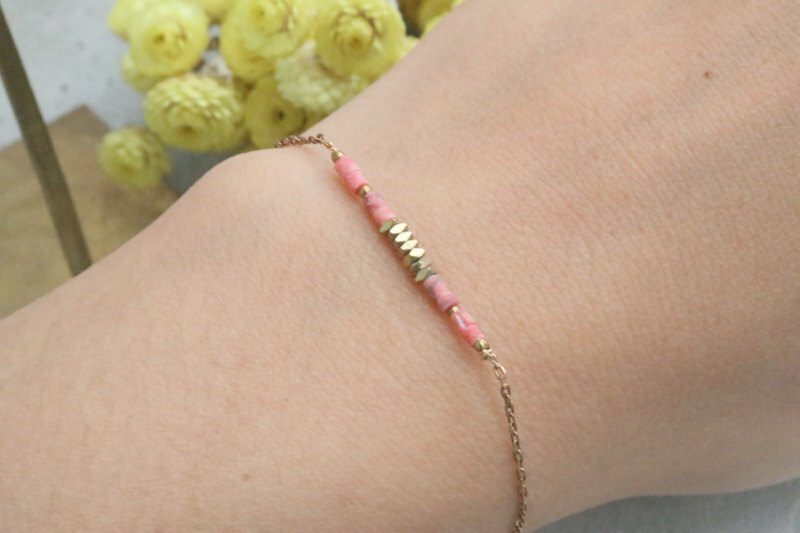 • Size: Coral 2mm a month ☞ Due to different shapes and sizes of finished products, the finished product length may have an error of 0.1 ~ 0.4 cm. Choose your size _________________________________________________________ Measure your hand around: Please use a slight thickness of the wire (for example: headphone cable, mobile phone charging cable) around the hand in a circle, measured by flat foot to measure the hand-around the length. Proposed production length: bracelet larger than hand circumference 1.0 cm, bracelet larger than the hand circumference 1.5 cm. ☞ Because of the different shapes of natural stone, brass and other materials, they do not wear completely like wire Product packaging ___________________ ☞ Consumption over 1000 yuan gift cotton cloth bags, packaging styles from time to time change, please refer to the new shelves page. https://c1.staticflickr.com/1/479/31523541635_e46043d0f7_b.jpg Shipping time. Shipping information ___________________________ Orders ordered goods, about 3 to 5 days sent. For urgent items, please contact the designer. Goods are hand-made after you order the purchase, except after the sale of flaws does not provide return. Precautions. Use and maintenance _________________________________________ https://c2.staticflickr.com/6/5604/31446793846_c535a0fc04_b.jpg ☞ For natural stone, the color depth, texture, crystal, shape, size, thickness, etc. of each natural stone product will be different due to the different methods of mining veins and cutting materials. There may be cracks, impurities, mineral deposits, etc. Other minor flaws, the actual finished product can not be exactly the same with the product. ☞ Electroplating metal contact with water will fade oxidized and can not be easily restored, please avoid touching the water or wearing a bath. ☞ One piece of sterling silver and brass metal ornaments, pendants, etc. are all "matte" polished, non-mirror polished. ☞ All the images in the picture may have a color difference due to different factors such as light or computer screen resolution.